SEATTLE, WA--(Marketwire - September 26, 2007) - Advanstar Communications, Inc., a leading worldwide provider of B-to-B marketing and business information products and services, is working to deploy the iCopyright® suite of web-based licensing and permission tools on numerous web sites in its Life Sciences, Powersports, Automotive and Licensing Divisions. 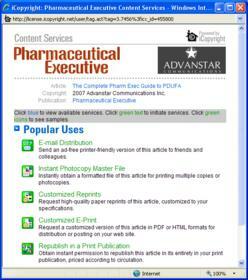 With these new content tools in place, users of web content in publications such as Medical Economics and Pharmaceutical Technology may obtain permissions for legal reuses of copyrighted content by clicking on iCopyright tags embedded in each article, or order custom reprints and e-prints online. Announcing the new relationship, Mike O'Donnell, iCopyright Founder and CEO said, "Advanstar is an important B-to-B publisher of trusted and sought-after content. We are delighted to be able to offer Advanstar's readers a comfortable way to quickly and legally email, print, save, and license online articles. Advanstar joins the ranks of other leading B-to-B publishers, who generate additional new revenue and reduce red tape by using iCopyright's suite of content services." "iCopyright's tools help educate users about proper use of copyrighted works while providing an easy, convenient and often free license to reuse and share copyrighted content legally and still provide publishers with income through ad revenues. Everybody wins!" claimed Barry Gilbert, Advanstar Content License Executive. The complete suite of iCopyright services includes ad-supported no-fee permissions for limited printing and e-mailing; instant permissions for e-mail distribution, photocopies, republication and excerpting; customized reprints and e-prints; and convenient reader services. Publishers who implement these services on their web content open a new level of engagement with their readers and capture a new stream of revenue. Advanstar Communications Inc. (www.advanstar.com) is a leading worldwide media company providing integrated marketing solutions for the Fashion, Life Sciences and Powersports industries. Advanstar serves business professionals and consumers in these industries with its portfolio of 87 events, 58 publications and directories, 125 electronic publications and Web sites. iCopyright (www.icopyright.com) is the intelligent copyright system for digital content. The Codie-Award winning service currently handles thousands of online permissions every day. iCopyright has generated millions of dollars in new licensing revenue for online publishers. iCopyright also markets Clip&Copy®, the media monitoring service that pushes iCopyright-tagged content to subscribers daily (www.clipandcopy.com). About this company iCopyright, Inc.